Control of bladder function involves the somatic efferent as well as autonomic sympathetic and parasympathetic systems. Bladder filling as well as emptying is organized by 3 centers along the central nervous system, which act through peripheral nerves on receptors in the neuromuscular junctions of the muscles in the bladder, bladder neck, urethra, diaphragm, abdomen, and pelvic floor. The sympathetic nervous system regulates the process of urine storage in the bladder. In contrast, the parasympathetic nervous system controls bladder contractions and the passage of urine. The somatic efferent system permits voluntary control over the external periurethral sphincter. Sympathetic efferent nerve fibers originate from the lateral gray column of the spinal cord between T11 and L2. The sympathetic system has a long postganglionic chain that runs with the hypogastric nerve to synapse with alpha and beta receptors in the bladder wall and the bladder neck or internal sphincter. Beta receptors are responsible for mediating relaxation of the bladder with filling. Alpha receptors are responsible for tonically contracting the internal sphincter during bladder filling. The somatic efferent nerve fibers originate from the pudendal nucleus of S2-S4 and supply the external periurethral sphincter. The external sphincter is under voluntary control and normally contracts in response to coughing or the Valsalva maneuver or when a person actively tries to prevent or halt urine flow. Therefore, when the bladder retains urine, alpha1 receptors on the trigone, bladder neck, and urethra activate contraction, while beta-adrenergic receptors in the bladder body relax the detrusor muscle to permit filling. Somatic efferent fibers from the cerebral cortex permit voluntary contraction of the external sphincter to provide extra support. Alpha-adrenergic receptors in the trigone, bladder neck, and urethra stimulate relaxation, while the muscarinic receptors in the detrusor body stimulate contraction to facilitate bladder emptying. Central control of micturition is performed by 3 areas: the sacral micturition center, the pontine micturition center, and the cerebral cortex. The sacral micturition center is located at the S2-S4 levels and is responsible for bladder contraction. 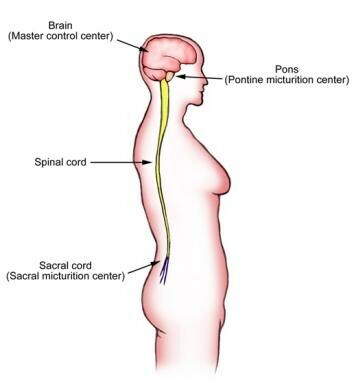 The pontine micturition center acts as a central relay and may play a role in the coordination of external sphincter relaxation with bladder contraction. The cerebral cortex plays an inhibitory role in relation to the sacral micturition center. Lesions of the peripheral nerves or the sacral micturition center cause detrusor areflexia. These lesions may affect the conus medullaris, the cauda equina, and S2-S4 peripheral nerves. Common causes of sacral lesions are trauma, stenosis, tumors, peripheral neuropathy, and infection. In general, these lead to variable loss of parasympathetic and somatic nerve function. Detrusor areflexia, bladder neck incompetence, or loss of external sphincter function may occur and present as bladder distention with overflow incontinence. Lesions of the spinal cord or brainstem below the pontine micturition center, but above the sacral micturition center, lead to uninhibited bladder contractions with uncoordinated sphincter activity. Suprasacral lesions are associated with the group of neurogenic bladder problems caused by spinal cord lesions from trauma, tumors, or spina bifida, as well as multiple sclerosis or transverse myelitis. These lesions cause interruption of the spinobulbospinal reflex. Two pathological mechanisms are in play here. The first is an acute areflexia and then detrusor hyperreflexia. The second is detrusor-sphincter dyssynergia, where the external sphincter contracts at the same time the detrusor contracts. Individuals with lesions below the pontine micturition center have both detrusor hyperreflexia and detrusor-sphincter dyssynergia. Suprapontine lesions lead to uninhibited bladder contractions, which may be secondary to loss of cerebral cortex inhibition at the sacral micturition center. These lesions are often due to cardiovascular events, multiple sclerosis, dementia, brain tumors, or trauma. Suprapontine lesions are located at or between the pontine micturition center and the cerebral cortex and involve the spinobulbospinal reflex. They may or may not coincide with sacral lesions. These lesions present as uninhibited bladder contractions with retained voluntary urethral sphincter relaxation during micturition. In the context of neuropathic lesions, abnormalities along the micturition centers and peripheral nerves present with varying manifestations; however, most eventually develop into fibromuscular bladder dysfunction. The age at which bladder disorders occur is related to the age at the onset of the neurologic disorder. The male-to-female ratio varies greatly between disease entities causing neurogenic bladder dysfunction. In 1 study, the reported incidence of urinary incontinence, regardless of etiology, was 8.5% of females aged 15-64 years; in the same age group, only 1.6% of the male population reported being affected by urinary incontinence. No racial predilection is reported. The prognosis for recovery depends on the type, severity, and location of the lesion causing the bladder problem and can be organized by dysfunctions that are permanent, dysfunctions that resolve with treatment of the condition, and dysfunctions that require medical and/or surgical intervention. Permanent bladder dysfunction includes those patients with complete transaction of the spinal cord. These individuals remain on intermittent or indwelling catheterization for the rest of their lives. Causes of temporary, syndromic urinary incontinence include polyneuropathy secondary to vitamin B-12 deficiency. This improves with nutritional correction. Patients with upper motor neuron lesions (eg, strokes, MS, and spinal cord pathology) may have to depend on medications for the rest of their lives, although some degree of recovery may be expected. Those with anatomic derangements like pelvic floor weakness may find symptomatic improvement with surgical correction. For patient education resources, see the Kidneys and Urinary System Center and the Cancer and Tumors Center, as well as Bladder Control Problems, Bladder Cancer, and Understanding Bladder Control Medications.